The Liberal Democrats are the only major party to have pledged £8 billion additional funding for our NHS, in accordance with advice from Simon Stevens, the Chief Executive of NHS England. Once implemented, the extra cash would mean at least extra £42 million in funding for Haringey’s health services, like hospitals, G.P.s and walk-in centres. This morning, Lib Dem Health Minister Norman Lamb called for the Conservatives and Labour to also match the Lib Dem commitment – to ensure the service is protected regardless of who is in Government. Lynne Featherstone, the Liberal Democrat candidate for Hornsey and Wood Green, has a strong local record on securing additional funding. Her recent local campaigns for fairer health funding secured an extra £30 million for Haringey’s health services over the last two years. “The Liberal Democrats are the only party who have pledged the extra £8 billion needed by our NHS by 2020 – in accordance with the advice from the Chief Executive of NHS England. “We believe the NHS should always remain free at the point of delivery, and delivered base on need rather than ability to pay. That’s why we’re committed to giving the NHS the funding it needs to carry on providing a high quality service. “The extra £42 million would be most welcome in Haringey – for our hard working NHS staff and patients alike. The fairer funding is making a difference, but further resources would be most welcome. An extra £550 million of NHS funding has been announced by the Government to improve access to GPs, modernise GP surgeries, and improve out-of-hospital care. Seven practices in Haringey – including the Vale Practice, Crouch Hall Road Surgery and Evergreen House Surgery – are receiving a share of the extra money. The Liberal Democrats are the only party to have pledged £8 billion in extra funding for the entire NHS – in line with advice from NHS England Chief Executive Simon Stevens. “The extra funding is a welcome boost for our GPs, surgeries and local patients. “Access to healthcare should be free at the point of delivery and based on need alone. That’s why this extra money to improve access to GPs and to modernise local services is so important. It should also go some way to reducing A&E traffic. 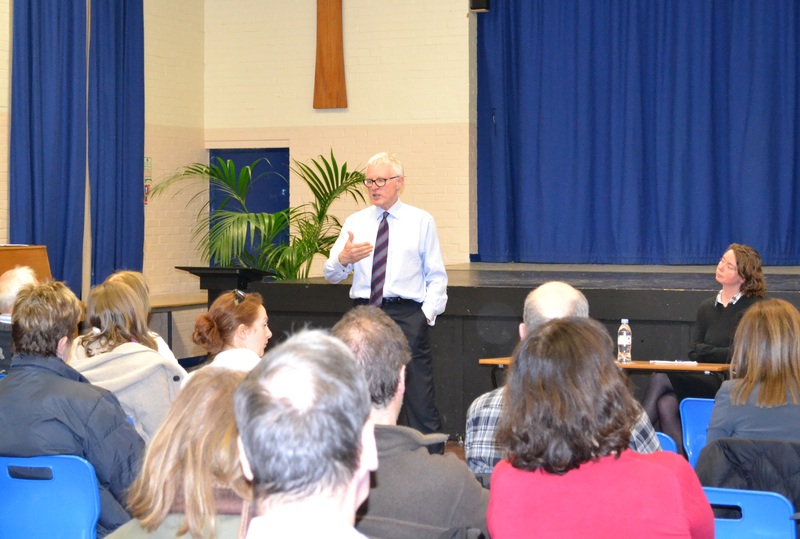 Health Minister Norman Lamb will attend a public meeting in March, to discuss his work on the NHS, social care, and mental health with local residents. The meeting – arranged by local MP Lynne Featherstone – will take place at 7:15pm on Wednesday 25th March at a venue in Hornsey. Residents interested in attending should email Lynne Featherstone MP for details. One in four of us will suffer from a mental health problem in our lifetime. It is a stark figure, made worse because there is still a stigma attached to psychological conditions. To address this, Nick Clegg and the Lib Dem Care Minister, Norman Lamb, recently launched the Coalition Government’s new action plan for mental health. The plan outlines 25 priorities for improving the support and care provided to those with mental health issues. These include integrating mental and physical health provision, promoting psychological wellbeing for children, and increasing access to care. Priorities have been distorted for years. The last Labour Government introduced waiting times for hospitals, but they failed to bring them in for psychological treatment – this needs to change. As Nick Clegg said, ‘it is time to bring mental health out of the shadows and to give people with mental health conditions the support they need and deserve’. This will be a multi-agency approach, as it is not simply a matter for the NHS. Better support in education, employment, and housing will give people the help they need to get on. Ignoring mental health now will just compound the problem in the future – so the Liberal Democrats in Government are taking action. I am delighted that Nick Clegg has made this a priority. I strongly believe that these changes to mental health care will help create the fairer society we need, as well as providing a positive model for other countries. Are you eligible for the flu jab? It’s that time of year again. No, not Christmas (yet!) – I’m talking about flu season. It might not be the most attractive topic for an MP to address, but I believe it is incredibly important that people are made aware of the free vaccine available from the NHS. Almost everyone can benefit from the jab, and so it’s well worth taking two minutes to sign up for it. Everyone over the age of 65, as well as two and three year olds. Everyone living in a residential home, or working in care. Everyone under 65 who has a heart condition, chest problems, kidney disease, poor immunity, diabetes, liver disease, a neurological condition or spleen issues. New steps have been taken to encourage the vaccine for children as they tend to be more susceptible, and can pass on the illness to their siblings and friends very easily. A safe and effective nasal spray has been developed, which will be available to children over 2. This is a much quicker method of administration, and will hopefully avoid any tears! It is worth bearing in mind that there are some people who shouldn’t have the jab – Certain types of vaccine are unavailable to those who have had a previous allergic reaction to a flu injection, those allergic to hens’ eggs, and people with certain immunodeficiencies. If you are unsure, consult your GP. There are some common side effects, and like any other vaccine it can’t protect against 100% of influenza infections. However, for the vast majority of people involved, this year’s immunization drive will protect against up to four strains of the virus until late 2014. The vaccine is a very effective way to avoid suffering from the flu this winter, and so I urge as many people as possible to go to their GP as soon as possible.